Oklahoma Sooners QB Baker Mayfield was arrested on Saturday. The 2016 Heisman Trophy finalist is not having a great offseason. Baker Mayfield, the Oklahoma Sooners’ talented starting quarterback, was arrested Saturday after an incident in Fayetteville, Arkansas. Early Saturday morning, according to the police report, Mayfield was picked up and arrested on several counts, including assault and battery, public intoxication, and fleeing the scene. The latter count is a felony. The report goes on to describe Mayfield’s subsequent arrest and detention. The University of Oklahoma released a somewhat hurried statement later, according to Jake Trotter. It is unknown what actions, if any, Oklahoma will take against Mayfield. It is doubtful whether they will remove him from play altogether, however. 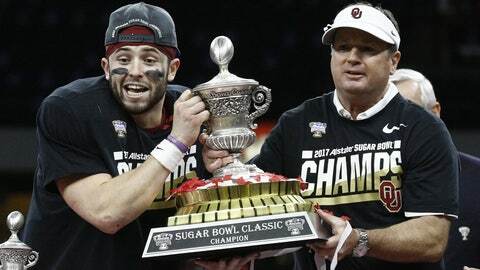 Mayfield, a Heisman finalist, was one of the program’s stars last season, throwing for nearly 4,000 yards with eight interceptions and 46 touchdowns.